MIAMI—Sky-Skan, Inc. recently installed a complete audio solution by HARMAN Professional Solutions at the newly opened Phillip and Patricia Frost Museum of Science. As the world’s leading designer and installer of fulldome planetariums and visualization theaters, Sky-Skan created a design that features an 8K 3D projection system with specialized Christie Digital projectors that deliver 30,000 lumens of brightness, making it one of the brightest projection systems on the planet. To complement such a remarkable video system, Sky-Skan needed to design a high-fidelity audio solution capable of delivering crisp, powerful and natural-sounding audio. After careful consideration, Sky-Skan designed and installed an integrated HARMAN solution made up of JBL Professional CSX F35 loudspeakers, Crown power amplifiers, BSS Soundweb London signal processors and AKG microphones. The design also features Martin wash lights and Martin system controllers that control both the audio and lighting systems. The HARMAN audio solution includes 12 JBL CSX F35/90 loudspeakers, 4 JBL 5628 subwoofers, Crown DriveCore Install and I-Tech HD Series amplifiers, and BSS Soundweb London BLU-806, BLU-100, BLU-USB and BLU-120 signal processors. The system is controlled by Martin M-Play, M-Touch and M2PC control surfaces with Martin M-PC controller software. Sky-Skan also created a custom software interface that enables the Martin control surfaces to control audio from the BSS processors and the house Lutron lighting system. AKG WMS470 wireless microphone systems and presenter sets are used by special event hosts and projector operators. 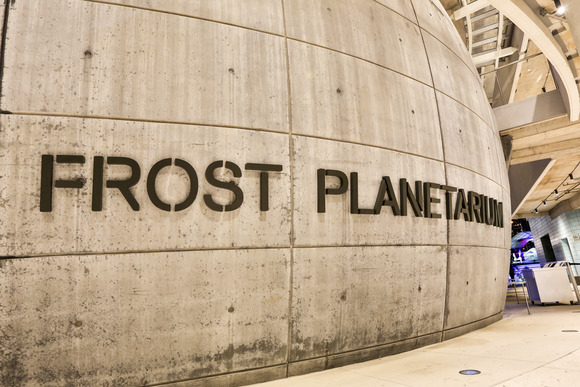 While every component of the system is important, the JBL CSX F35 loudspeakers play a critical role in the planetarium. Before Sky-Skan signed on to the project, the museum’s technical team had initially spec’d another speaker brand for the design, but the cost was extremely prohibitive for the rest of the project. Barnett began looking for a speaker that could deliver the highest quality audio, while remaining within budget. Barnett travelled to JBL Professional’s headquarters in California to test the CSX F35 loudspeakers in person. At that point, he knew he had found the perfect speaker for the Frost Planetarium.